CAIR is Hamas. See UTT document listing key evidence HERE. 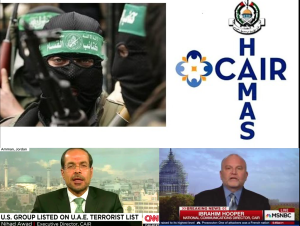 Share UTT’s CAIR is Hamas document with your local media, law enforcement, churches, civic groups, local elected officials, schools, businesses, hotels, etc. This way when speakers come to your town to share the truth about the Islamic Movement and CAIR tries to shut it down, the community already knows CAIR is a part of the terrorist organization Hamas. Bring UTT to your local schools, churches, civic organizations to share the truth and evidence about the Muslim Brotherhood’s Islamic Movement here in the United States. Encourage your police and sheriff’s office to host UTT’s 3-day “Understanding and Investigating the Jihadi Network” in your community. Islam’s unambiguous declaration of war* on Western civilization (dated 22 May 1991) was serendipitously seized from a subterranean basement in Annandale, Virginia in 2004, by Special Agents of the FBI in compliance with a federal search warrant. Yet, not withstanding: the passage of 26.65 years; the intervening 9/11 attacks by sharia-adherent Muslim-jihadist savages (which claimed 2777 lives); the only presidential-interregnum gap in American history (2008-2016) which occurred due to usurpation involving false pretenses, counterfeiting, perjury and Congressional oversight-malfeasance; and the construction of 3100 Saudi-Arabian funded (80%) Mosque arsenals wherein “death to the American infidels” is the consistent essence of the chant of the day, all the U.S. Senate has contextually managed to do, is establish a “committee” under the reckless purview of a nepotistic perverted misfit which has effectively initiated a destructive coup d’état involving the morale & in-house (where it belongs) disciplinary regimen of the United States Marine Corps at the behest of collusive garden-variety feminist agitators, and to the treasonous detriment of national security and the lives of individual male Marines; I.e., the finest fighting men in the world. Furthermore, for our government to have allowed said body of political opportunists to compel General Officers of the United States Marine Corps, not to mention the Corps Commandant as well, to sit like chastened school boys in the presence of said garrulous frauds and their “fake news” novelist scribes, was a national disgrace which should be commemorated for all time with black ribbons on the lapels of the respective committee’s members so the American people, particularly their constituents, will know who they are. God bless America, and God bless the United States Marines (MALE & FEMALE) without whom we’d be kneeling to Allah and living in a draconian hell known as sharia. *To secure an Arabic-to-English verbatim translation of said “declaration of war” (for a nominal handling & postage fee) contact: http://www.securefreedom.org and request your copy of: GOVERNMENT EXHIBIT 003-0085 3:04-CR-240-G U.S. v. HLF, et al. Can you please explain why the U.S. Justice Dept., Defense Dept., FBI, & CIA have not demanded CAIR by outlawed in the USA? Muslim brotherhood has been cleverly disguised, as an professional organization innocuous, non political, offering solutions and to our government in the war against Islamic terror and has successfully deceived these organizations to view Islam as a tolerant, peaceful religion to get cover of religious protection when is striving to bring sharia law into the U.S.. it works to create other organizations to build a support system to infiltrate and subvert with disinformation campaign and get control of the assets and attain power. It occurred due to the ability by the MB to get our government to dismiss the accurate information about Islam and sharia which forbids exposing the goal the support of terror, padded with money and deception, with organized eruptions and protests take place whenever the smoke screen loses it’s concealment that the Quran is the catalyst and root of terrorism that views all non muslims as the enemy, all borders non existent the world as their caliphate aided by the left propaganda and hatred and purging of all adjectives that would pinpoint the problem to come.In my opinion.